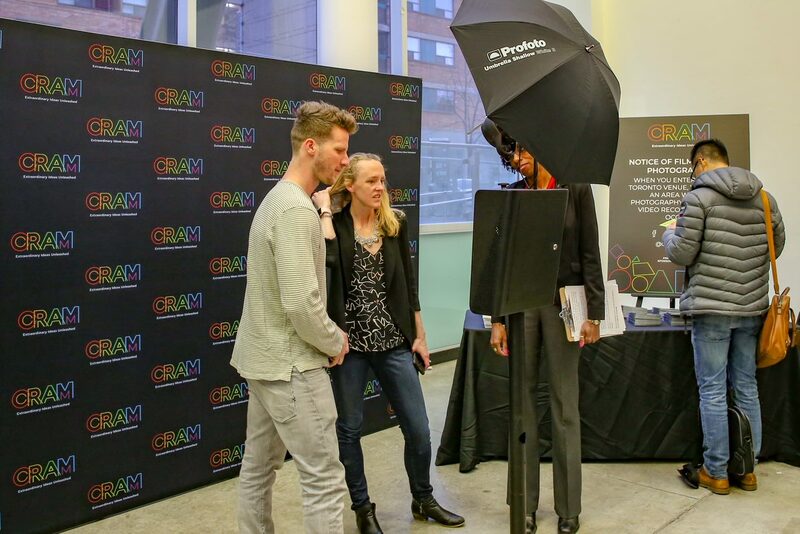 On Friday, April 5, OCAD University opened its doors during the CRAM learning festival to give attendees a chance to discover the unexpected ideas revolutionizing the way we think, live and work. 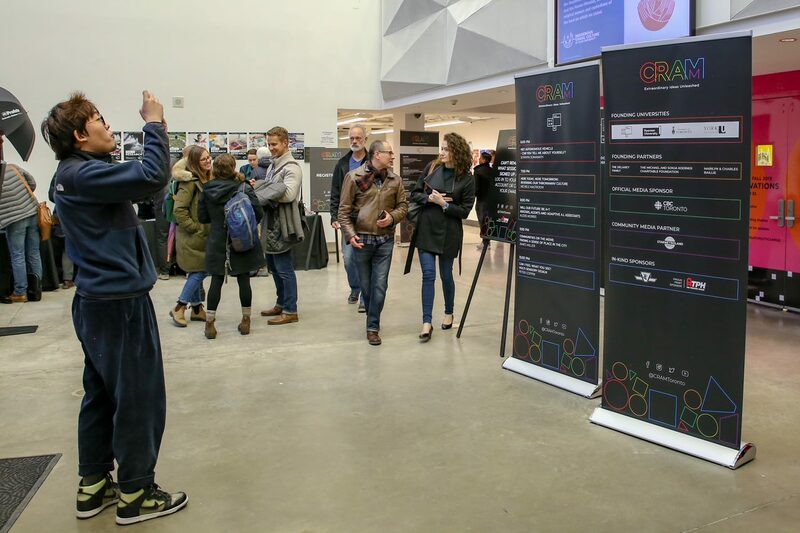 Featuring more than thirty free events, CRAM is the first learning festival of its kind in Canada. Toronto's four universities -- OCAD U, University of Toronto, York University and Ryerson University -- offered more than thirty free events. “I need a new cell phone even though my old one still works." In current Western society, vast amounts of goods are disposable or easily displaced by “the next new thing.” Old technologies have value in science fiction: inStar Wars, starships can be decades old and droids centuries old. Currently, we’re seeing a rise in subcultures who appreciate long-lasting goods and people are heading to Repair Cafés in an effort to keep waste to a minimum. What can we learn from them? How can we shift our current consumer culture to a more sustainable one? We live in a highly visual world that excludes a significant number of people who are visually impaired or blind. Think about all the things around us and the way they’re designed - whether it’s our homes, our workplaces and the city we live in. 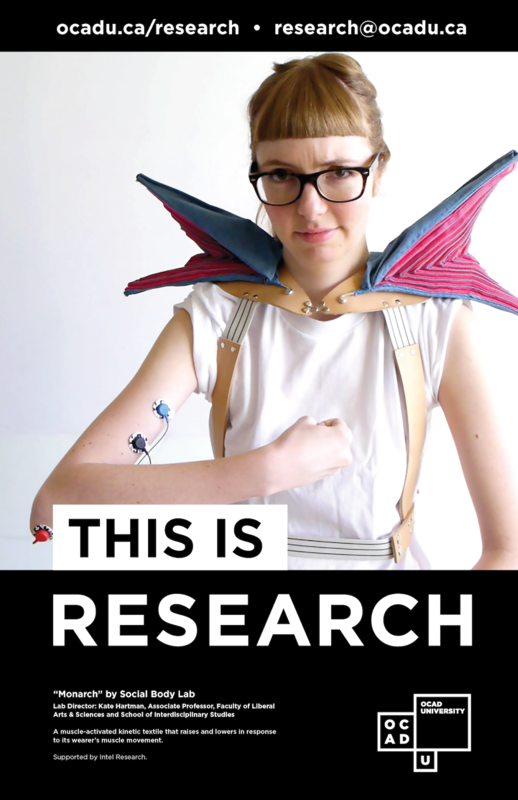 “I’m a visual person but as a researcher it became clear to me that we don’t have a good scientific understanding of design, and why we use certain kinds of representation that exclude people,” said Coppin. Who are we designing for? Can we create multi-sensory designs that would allow us to hear a financial chart, feel a soccer game or use multiple senses to perform everyday tasks? These questions are explored. The panelists will be Dr. Dori Tunstall, Dean, Faculty of Design; Dr. Ashok Mathur, Dean, Graduate Studies; and Ryan Rice, Associate Dean, Faculty of Liberal Arts & Sciences and SIS. The panel moderator will be our Vice President of Research and Innovation, Dr. Robert Luke. CRAM Toronto is coming to OCAD U! On Friday, April 5, 2019, Toronto's four universities - OCAD University, Ryerson University, University of Toronto and York University - open their doors to give curious minds from across the city a chance to discover the unexpected ideas revolutionizing the way we think, live and work. In one evening, CRAM will feature 30+ free events, allowing attendees to move between the four university campuses, to explore the city's cutting-edge thinking. Have you ever asked yourself what's the greatest story never told? How does gravity affect our perceptions of ourselves? What do viruses have to do with gun violence? Will a robot be your new BFF? Register today at www.cramtoronto.com to find out! CBC Toronto is a proud sponsor. Cost: FREE! Space is limited so reserve your seat at www.cramtoronto.com. Ontario recently approved the testing of autonomous vehicles without a driver on public roads. What will this mean for pedestrians, especially when crossing the street at intersections without signals? People make the decision to cross based not only on vehicle speed, but also using non-verbal cues such as eye contact and hand gestures. What will happen in this new world of driverless cars? I’m excited to share some of the computer interfaces we have prototyped and the lessons we’ve learned from evaluating them. “I need a new cell phone even though my old one still works." In current Western society, vast amounts of goods are disposable or easily displaced by “the next new thing.” Old technologies have value in science fiction: inStar Wars, starships can be decades old and droids centuries old. Currently, we’re seeing a rise in subcultures who appreciate long-lasting goods and people are heading to Repair Cafés in an effort to keep waste to a minimum. What can we learn from them? How can we shift our current consumer culture to a more sustainable one? Please join me for a thought-provoking discussion. How will we be living in Toronto in the 2020s? I’ll offer an outlook on the technologies that will affect how smart cities and smart citizens interact. We’ll look into the current and upcoming system design challenges for mixed reality (augmented and virtual reality), the internet of things, and adaptive A.I. assistants. Let’s move towards engaging and immersive interactions across highly-connected human-machine environments. The future is coming very soon, so let’s get ready! From Oceania to Canada, communities are starting to migrate to urban centres as their ways of life are forever altered by climate change. How will we ensure the cultural continuity of these communities and preserve their way of life? As an architect, environmental design researcher, and a Kanaka Maoli, I am fascinated by how community-based knowledge can mitigate vulnerability and sustain traditions. What if the design of our cities could support the identities of resettled communities and lessen culture loss, rather than alienate new arrivals? I’ll explore possible ways to help climate refugees maintain their identities in their new homes. We live in a highly visual world that excludes a significant number of people who are visually impaired or blind. Think about all the things around us and the way they’re designed - whether it’s our homes, our workplaces and the city we live in. I’m a visual person but as a researcher it became clear to me that we don’t have a good scientific understanding of design, and why we use certain kinds of representation that exclude people. Who are we designing for? Can we create multi-sensory designs that would allow us to hear a financial chart, feel a soccer game or use multiple senses to perform everyday tasks? We’ll explore these questions. Read more about CRAM Toronto is coming to OCAD U! A message from Dr. Robert Luke, VPRI, for the 8th volume of PULSE. 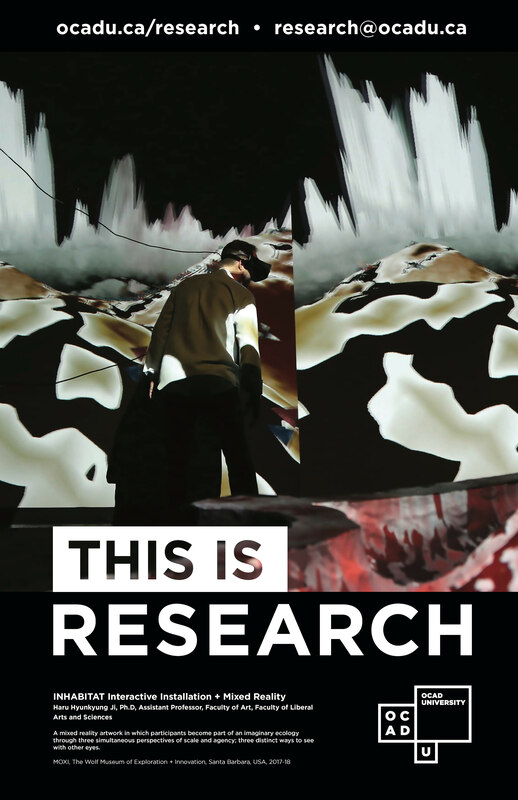 In the last issue of Pulse we announced the launch of our new communications campaign, This is Research at OCADU. 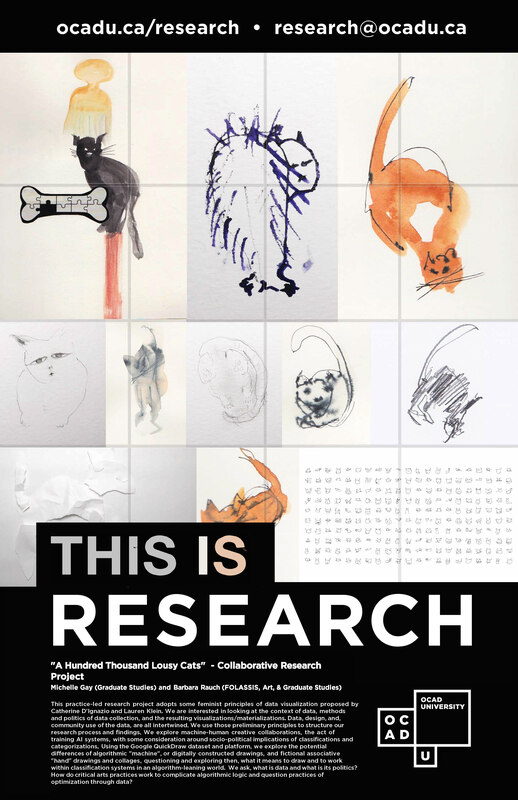 Since then you may have noticed several posters around campus – featuring Suzanne Morrisette, Judth Doyle, David McIntosh, Kate Hartman, Haru Hyunkyung Ji, and Michelle Gay and Barbara Rauch – that showcase the breadth and depth of research and research-creation that our faculty conduct. 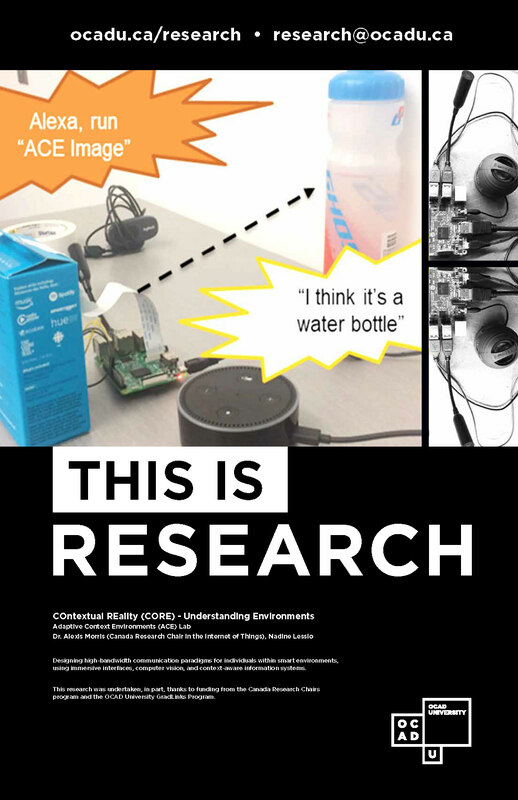 You can see these posters online here: https://www2.ocadu.ca/news/this-is-research. I like that these posters all communicate the complex ideas and knowledges that each faculty member is researching. 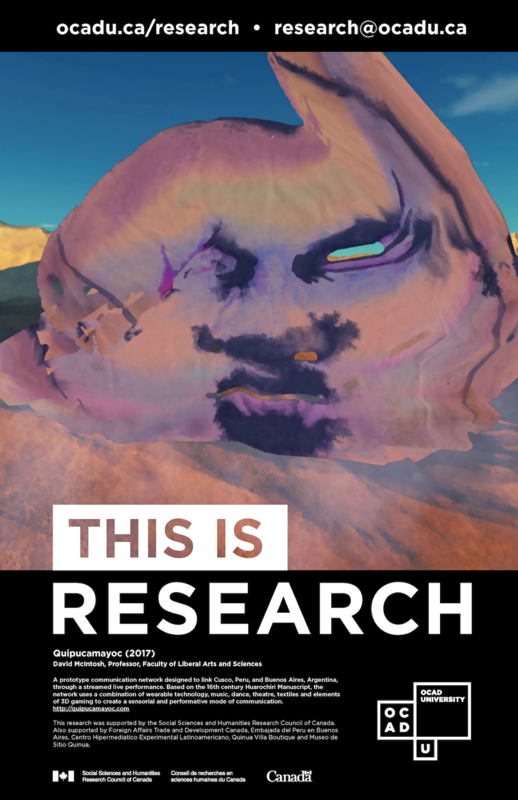 From the visual to the virtual, and the prototypical to the physical, each poster shows how our faculty are engaging with new forms of knowledge, materials and ideas at the forefront of research and creative practice. And, importantly, they demonstrate to our publics, our students and our partners, the value of ideation, exploration, knowledge and artistic creation. These themes and priorities build on the history of research excellence at OCADU while opening avenues to expand for the future. During the development of our new SRP I benefitted from conversations with many faculty on issues pertaining to Indigenous research and OCAD University’s commitment to decolonization. This was a key topic the that Research Committee discussed. In discussions with Professors Ryan Rice and Jason Baerg they advanced the idea that the new SRP affords a unique opportunity for the University to demonstrate our commitment to the Truth and Reconciliation Commission (TRC), in keeping with our commitment to decolonization, diversity, equity and inclusion as articulated in the Academic Plan. 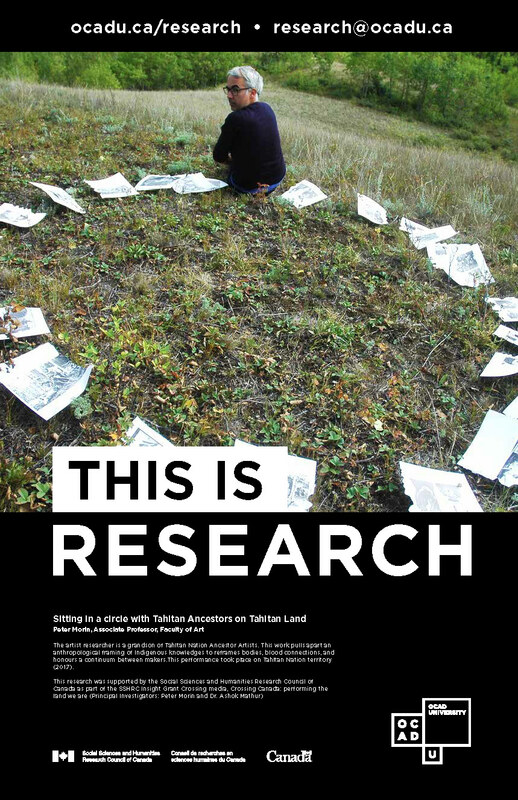 Specifically, there are several ways we can demonstrate our commitment to the TRC Calls to Action that will help to ensure that research at the University adhere to the Truth and Reconciliation Commission Calls to Action. The SRP has articulated our commitment to “Nothing about us without us,” as outlined in our Academic Plan. This principle stipulates that research involving Indigenous peoples must be led by Indigenous peoples. It is supported by the Tri-Council Policy Statement: Ethical Conduct for Research Involving Humans (TCPS 2 2014) which outlines our responsibilities in Chapter 9: Research Involving the First Nations, Inuit and Métis Peoples of Canada. Asking applicants to internal research funding and to our Research Ethics Board to indicate if their research will help OCAD U address the TRC Calls to Action, as one way to build capacity and awareness. There will be other suggestions for how we can achieve the goals outlined in the SRP that the we can take into account. Taking steps such as these our SRP Implementation will help to ensure that the TRC Calls to Action do not fade from practice. 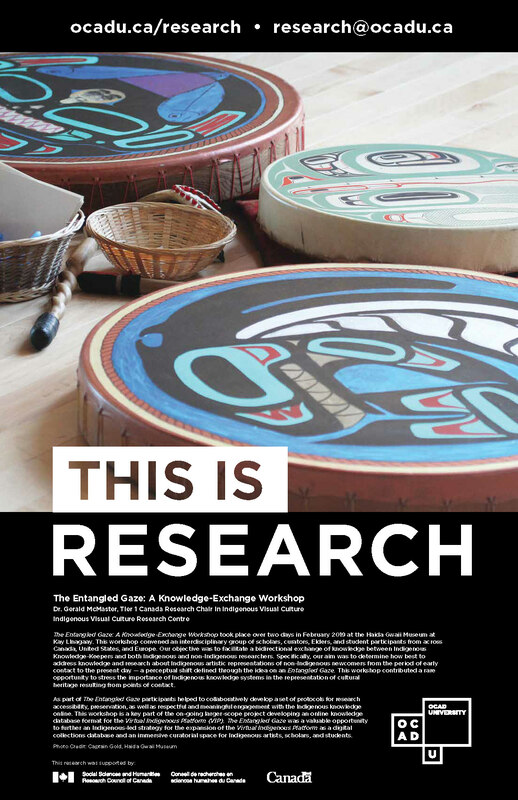 Enacting suggestions like these as part of the SRP Implementation will send a clear signal about our commitment to decolonization, help us educate the broader research community with whom we interact—faculty, students, communities and partners alike—on the importance of the TRC Calls to Action, and help us track progress over time against these goals. The SRP implementation is now proceeding, building on the Academic Plan and over two years of development that went into the new SRP. The Research Office is looking forward to supporting the University community as we embark on this exciting next step in our research journey. Dr. Peter Coppin teaches his students how to use inclusive design methodologies to solve real-world design problems. 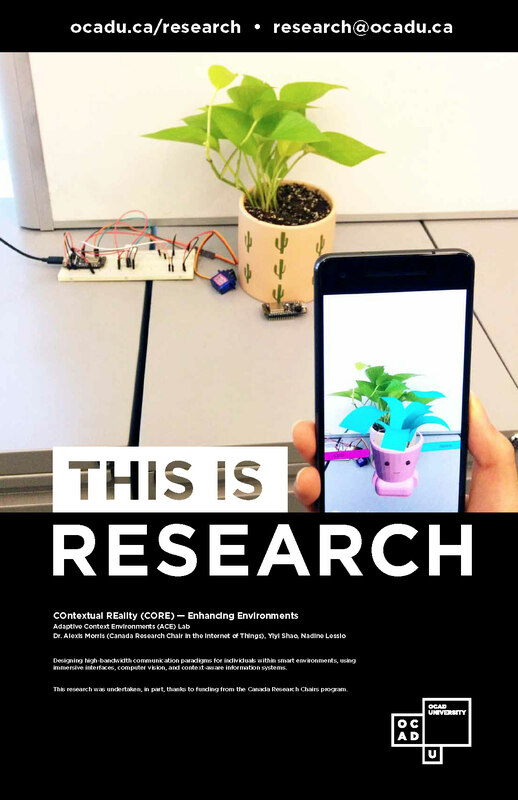 Students test their cross-sensory approaches through prototyping and experimentation. One of Dr. Coppin’s classes collaborated with the Art Gallery of Ontario to examine how design can help visually impaired people enjoy paintings. Students ‘interpreted’ two-dimensional paintings into three-dimensional artefacts using a wide range of materials to convey the shape, texture, and spatial relationships of objects depicted in the paintings. Read more about this unique activity as reported by the Toronto Star here.